Mushrooms gross many people out, but I find them to be fascinating and beautiful. I love how they spring up daringly out of nowhere, little puffs of white on a brilliant fall lawn, twisted in impossible positions on a tree in the woods, and even dangerously enticing with bright red polka dots on a boring old log. Like so many of my tastes, I inherited my love of mushrooms from my mother. She is such a devotee that she forages through the woods of the Loire Valley when the weather gets damp. She calls me whenever she happens upon some morilles (morels) or cepes (porcini) and raves about the aroma as she sautees them in butter. I stand in my kitchen, an ocean between us, hoping that her next call will not be from the emergency room. Because I am not that brave (some would say foolhardy), I limit myself to the safety and expense of supermarket mushrooms. I acted like a forager this week as I stood in front of the mushroom display at Whole Foods. I grabbed an assortment of mushrooms and brought them home to make this flavorful cream-less cream of mushroom soup. The mushrooms give it the creamy texture, but there is no fattening cream added. 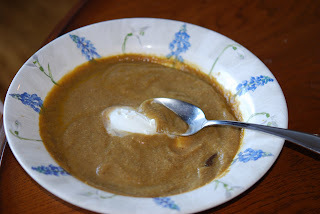 The earthy and rich flavor of this soup makes me happy that it is fall. Melt the butter in a large stock pot. Add the shallot, onion, carrot and bacon and cook on medium heat, for about 10 minutes, until the bacon is cooked and the vegetables are soft and translucent. 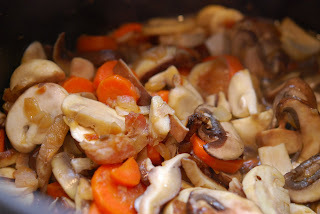 Add the mushrooms and saute for 5 to 7 minutes, until the mushrooms are bright and softened. Add the sherry and saute for 5 minutes until it has mostly boiled off but imbued the mushrooms with a delicious aroma. Add salt and pepper at this stage. Pour in the chicken stock and simmer for 30 to 45 minutes. Puree the resulting soup very well. Serve with a dollop of creme fraiche or a swirl of heavy cream.